Pearlie is an English/American cross. She is a big and healthy girl who weighs about 85 pounds. Pearlie’s last litter was 12 puppies! She is a great mother who takes amazing care of her babies. 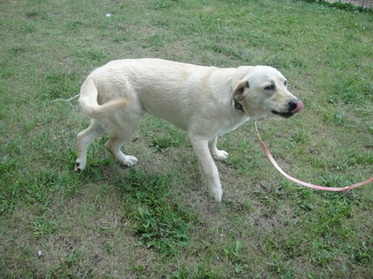 Pearlie is potty trained, knows basic manners, and is great with people and other dogs. Pearlie is a total goofball who loves to play. She has a healthy energy level and great drive. She will be nothing but an asset to any breeding or competition hunting program. Pearlie is too large to be air shipped, but she can be ground shipped at the expense of the buyer. We are asking an adoption fee of $3,000.00 for Pearlie. Full AKC registration is included.